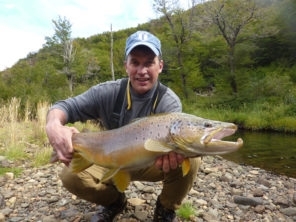 The Rio Pico region of Chubut province, Argentina is known somewhat privately amongst area guides and outfitters as the best "big trout" country in all of Patagonia. 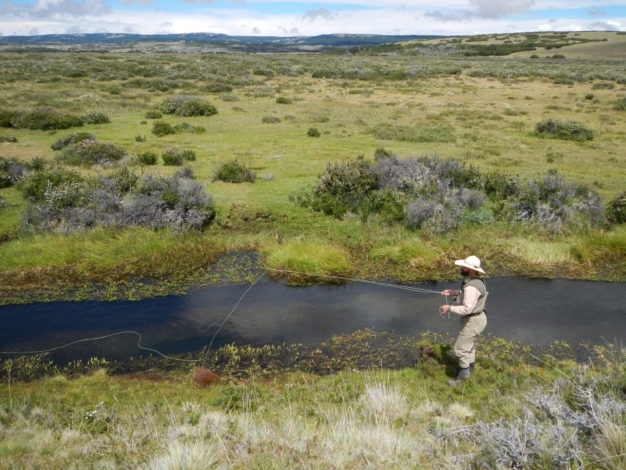 Comprised of an immense network of interconnected lakes and west-flowing Pacific drainages that cut their way back through the Andes, this water is as far off the beaten path as it gets. 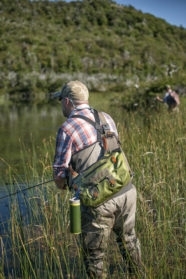 And the Rio Pico Trout Bum package offers a unique, low-cost access to this country for anglers who don't mind a less luxurious trip as long as it will get them into incredible fishing. 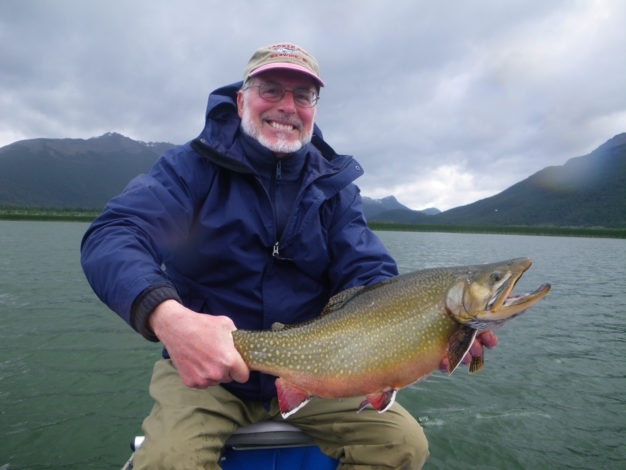 These itineraries are planned to utilize simple cabins, campgrounds with facilities, and sometimes even back-country camping set ups in order to fish a variety of spectacular environments as a means of maximizing time spent on the waters themselves with rod in hand. 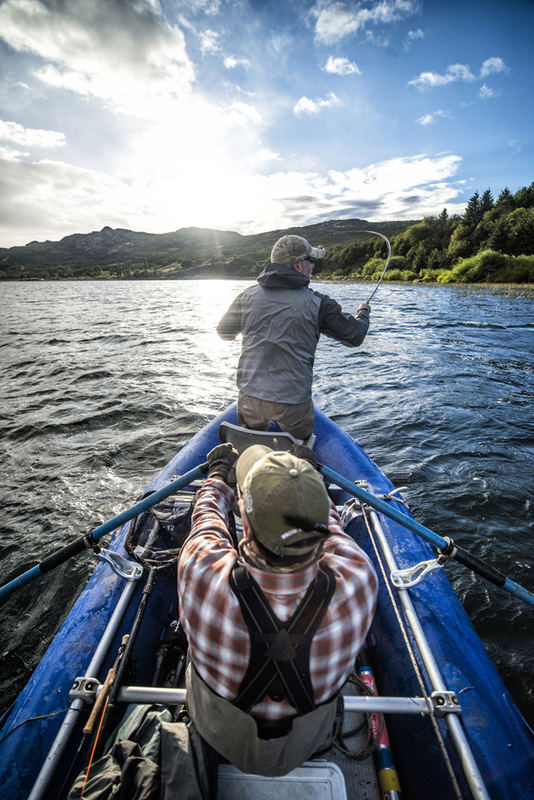 There are no mints on the pillows for sure, but the Hemispheres Unlimited team of guides does make certain that all i’s are dotted and t’s are crossed in the way of preparations, meaning you’ll have everything you need to make the most of your time in pursuit of the fish that brought you all that way from home in the first place. 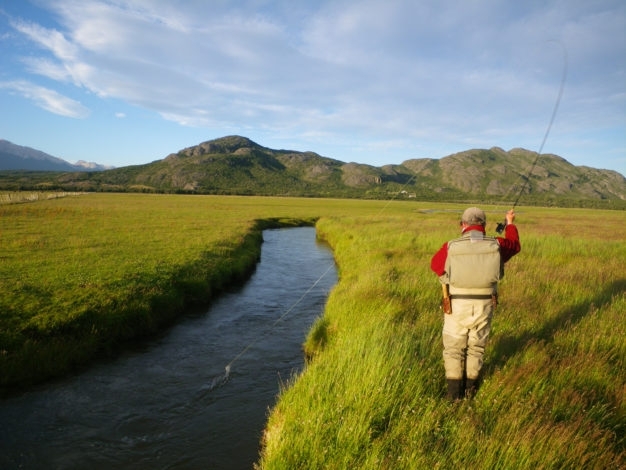 * Let us be the first here to give credit where credit is due: The term "Trout Bum" was coined (or at the very least first published) by fly fishing writer John Gierach, as the title of his popular 1986 collection of essays. 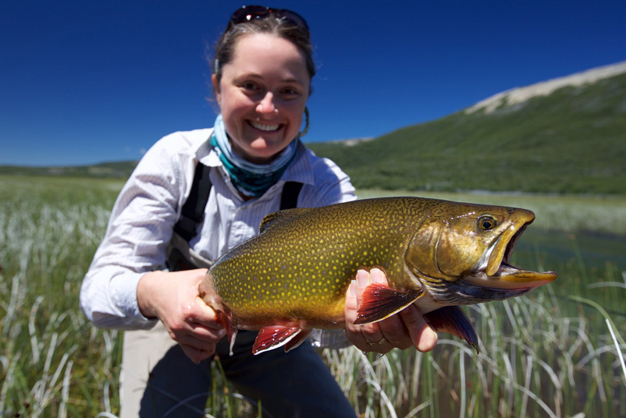 Though the local environment hosts an almost unbelievable quantity of waters in diverse types, shapes and sizes, the fact that a much higher than average number of these hold fish of “unusual size” is what accounts for the region's fame. The ones we're willing to name online (and there are many we are not) include the famous numbered lakes 1 through 5, the Rio Pico herself and her tributaries the Rio Nilson and Rio Las Pampas, and also the world famous Rio Corcovado, which drains an eighteen hundred foot deep, gin-clear lake called Lago Vintter. 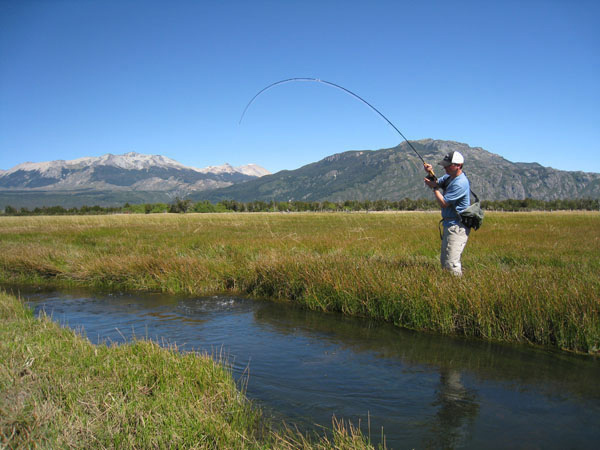 But scattered between those famous waters are an enormous number of smaller lakes, freestone streams, and even spring creeks, all of them holding trout. 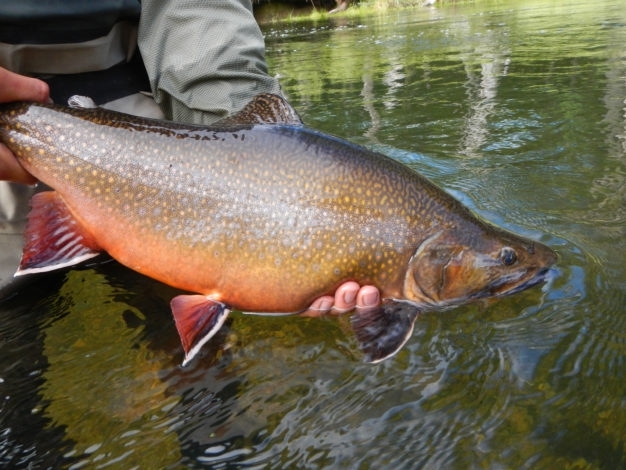 Rainbows, Brookies, and Browns, including many of “unusual size” swim these waters, and we pursue them with a wide variety of tackle and techniques. 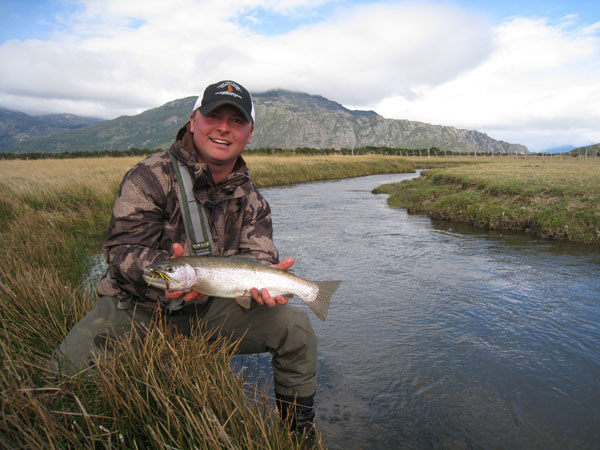 Anglers planning for the Rio Pico Trout Bum itinerary can express their preferences with regard to fishing styles at the time of their booking, as well as at any point during the trip. 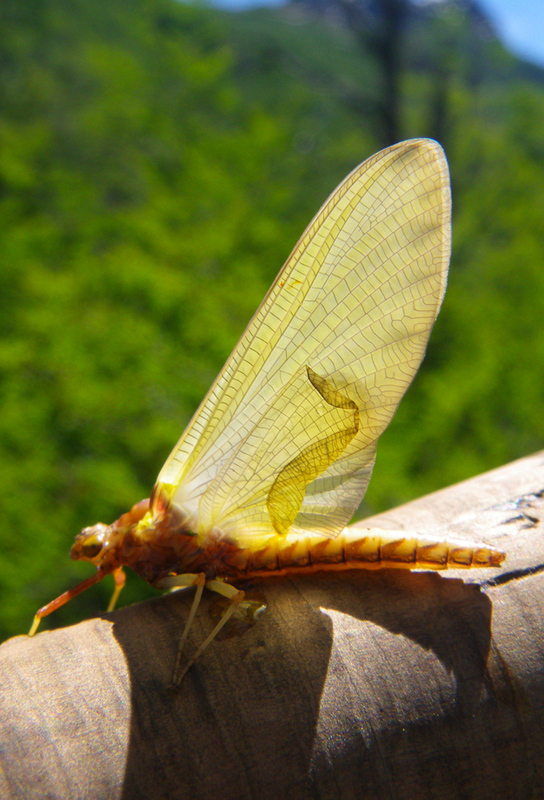 And with such an incredible array of options in the immediate area we can have you throwing dry flies with a three weight, chucking six inch streamers on a heavy sink tip, or even spey casting pretty much any day of the week. 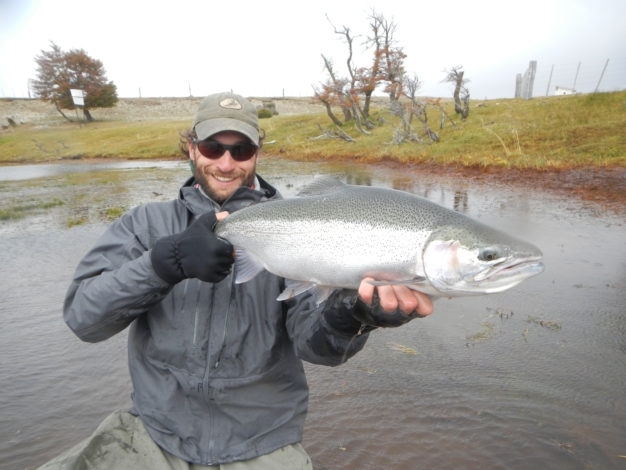 Some spots are numbers games, usually with pretty much constant action from what in Patagonia amounts to smallish or medium sized fish (which would be considered large in most of the world) while others are more for hunting bruisers (the ones from the pictures, which are the ones that most folks come down for). Our guides for the Trout Bum program are all locals who grew up on these drainages and know them like the backs of their hands; and with this much water at our fingertips it really just all boils down to the client’s personal preference. 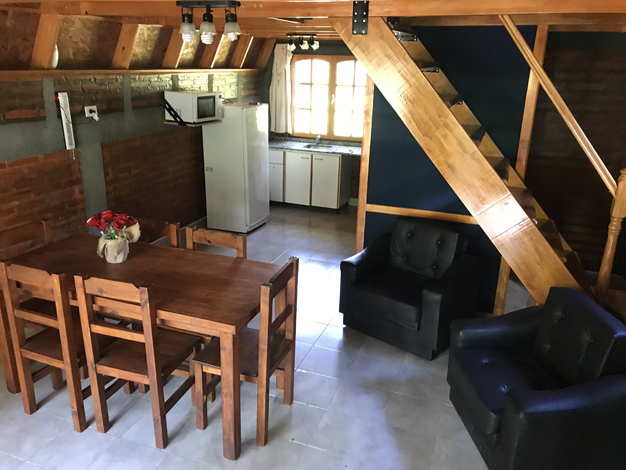 It is easy to do a different environment or style every single day even on a two week tour. 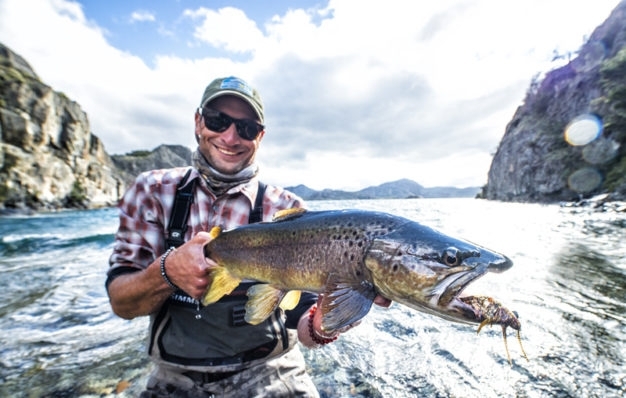 Plus, from the Andes to the Pampas, the landscape is so diverse that within a day's range we feel like we are in totally separate ecosystems and can experience a huge variety of different modalities of fishing. 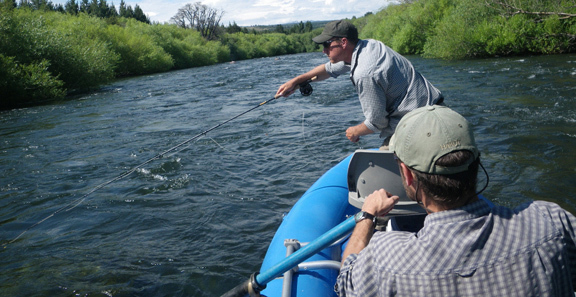 One of the questions we get quite frequently when folks are looking at doing a Trout Bum trip has to do with what kind of tackle should be used, and what we can provide. 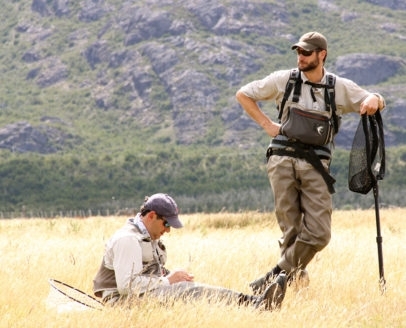 Upon signing up each angler receives our standard Pre-trip Information and Planning packet with detailed lists of everything they will need in the way of gear, clothing, and flies, as well as all sorts of other useful information on how to arrange the travel and what to expect in terms of details for the trip. 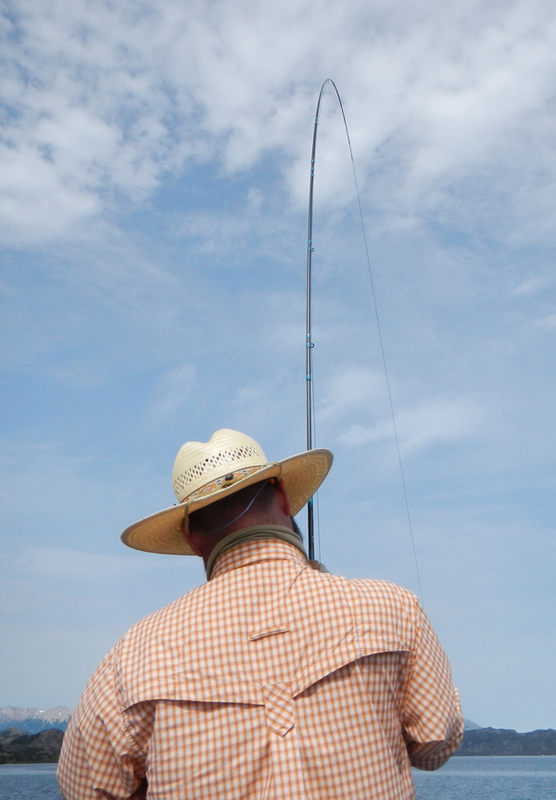 We can usually provide rods whenever necessary, but waders and boots need to be brought down for sure, and while our guides do all carry fly boxes loaded with their own local patterns (free for clients to use) it is always a good idea to bring what’s on the list as well if you can. Rod set ups are a pretty personal choice for most anglers, but generally we suggest nine foot sticks ranging from six weights up to eights, with floating lines for the lighter rods and floaters plus 12’ to 24’ sink tips for the heavier ones. Nine foot leaders are the norm, most of which will be 0x but some of which might go as light as 3x, and a few poly leaders in varying weights are never a bad idea. It’s pretty rare that we tie on anything lighter than 4x tippet but if you end up wanting to throw at some picky little 16” risers one day your guide will always have what you need. 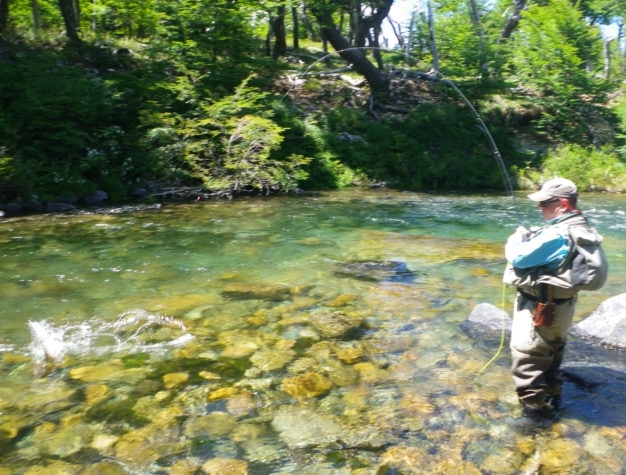 Another thing that is nice about the Rio Pico region is that it has such a diverse mixture of wading conditions and water that we can float. When we first set up the Trout Bum program we assumed that most of our clientele would be made up of guides from the states who were used to working hard out on the water every day but needed a trip that they could afford. We pretty quickly realized though that this was not the only market which was going to respond. Even those first years we started to see quite a few folks from age groups and demographics that required less physically demanding days than what our guide groups were generally looking for; but with more water for us to choose from than anyone could fish even in a month, this turned out not to be a problem. 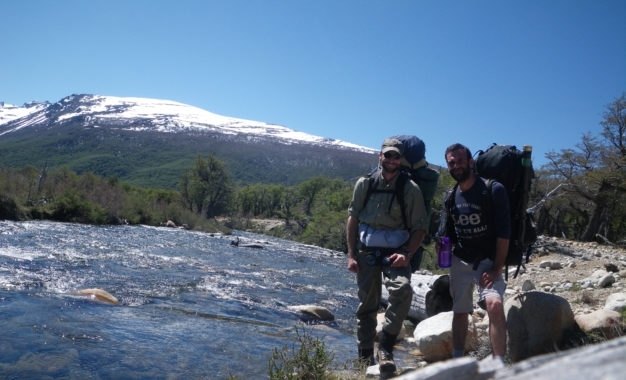 The program can be set up in a wide variety of styles ranging from being in the boat every day of the trip to mixing that up with easier wading, and all the way to the more extreme hike-in and camp expeditions. 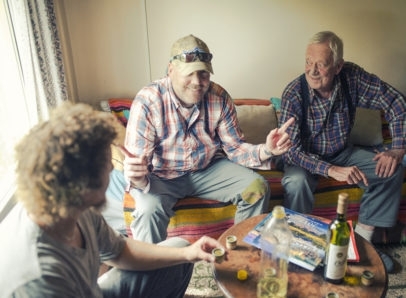 And as such, we have now found we get groups made up of everything from college aged guys who live and work in conditions much like our own to retired couples and groups of guys we used to guide at the five star lodges who are just looking for a more authentic small town Patagonia experience. Who knew? What we do know though is this – everybody goes home happy. 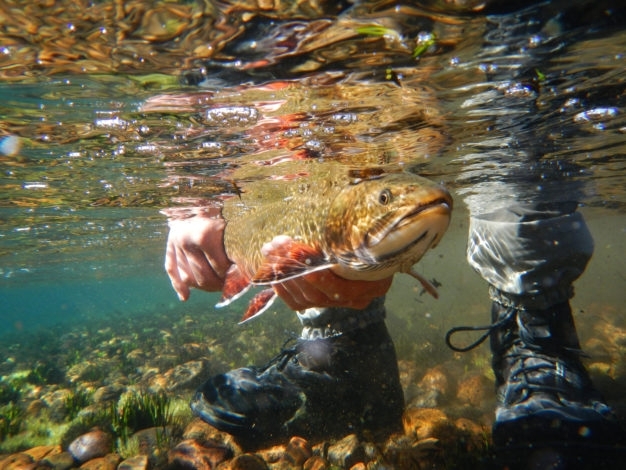 To date we’ve not had a single post trip report come back as anything other than glowing, and we encourage anyone looking into the Trout Bum program to talk to some of our past clients for first hand stories of what the experience was like. 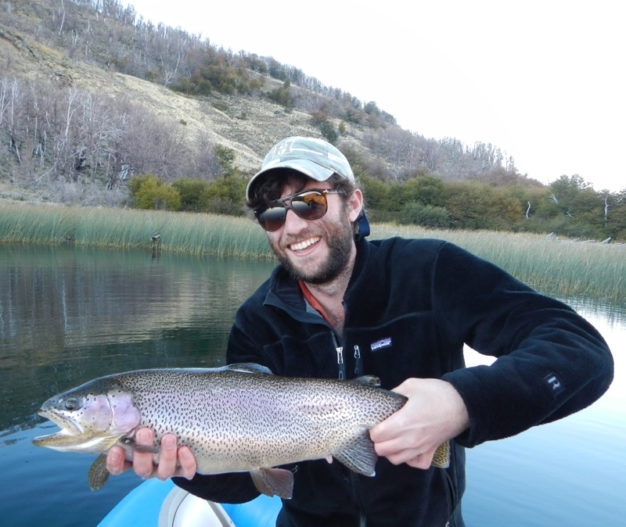 Accommodations for the Trout Bum program are probably best described as "authentic", in true, local, Patagonia style. 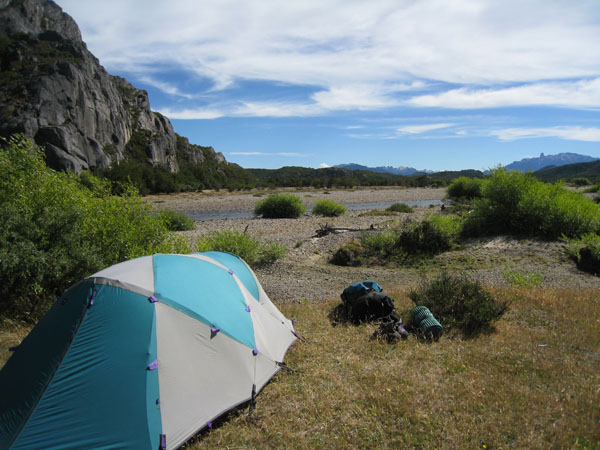 Unless there is a specific need for back country camping, we are usually set up at one of our local hospedajes either in town or out on Lago Tres. Each has its own characteristics, advantage, and style, and we are happy to spend as much time as necessary helping each group choose the option that is best for them. As the name suggests, this hospedaje is owned and managed by our man Vasco, a local character that fits the word “character” to a T. Of Basque descent (as the name suggests), Vasco was born and raised in Rio Pico and has been one of the town’s most famous jokesters and beloved personalities since he began working with fishermen over twenty years ago. Location: Downtown (if you can call it that) Rio Pico, centrally located such that our guides can go in any of the four cardinal directions each morning which maximizes fishing and minimizes drive time, plus keeps you close the stores that sell wine, beer, and liquor. 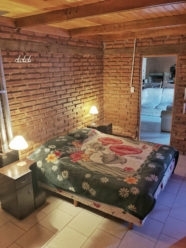 Sleeping arrangements: Two adjoining lodge set ups with two bedrooms each set up as triples three double beds, any of which can be turned into matrimonial suites by making kings size beds out of two double beds. Bathrooms: Each lodge space has one bathroom with shower, toilet, and sink. 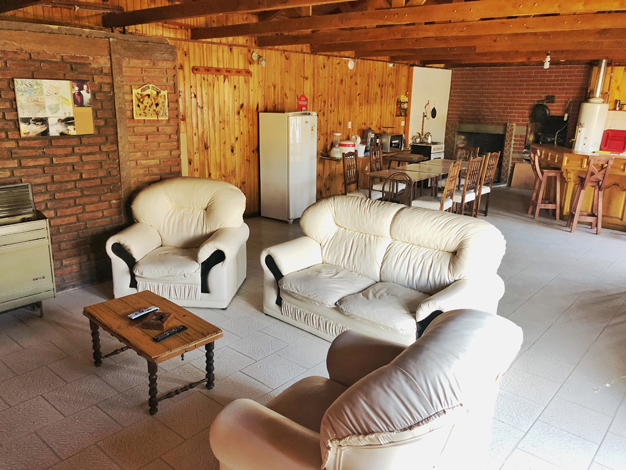 Common areas: Each lodge space has its own kitchen, dining area, and living room with sofas, lounge chairs, and TV. There is also a balcony, common space, and “quincho” where the asados are cooked. 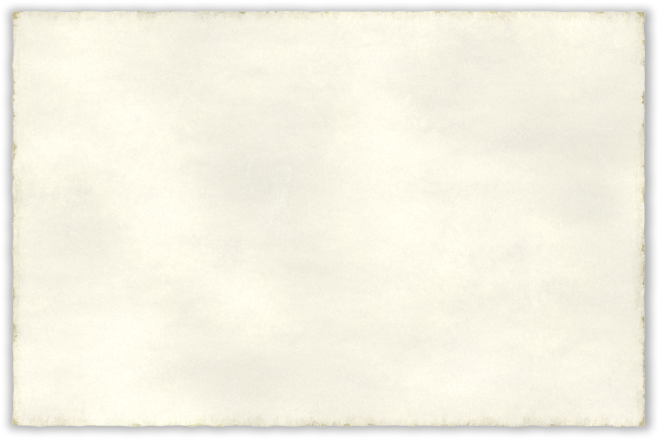 Cost: Included in standard rate – no upcharge. 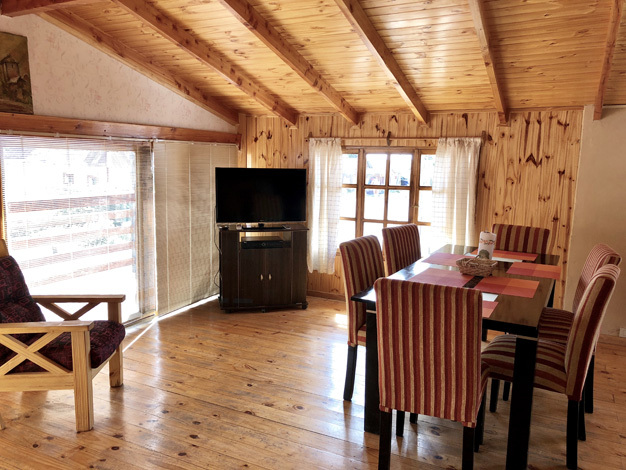 *Vasco's is one of our two most commonly used lodging set up due to its location and versatility. This means that it is important for reservations to be made as far in advance of trip dates as possible! El Madrugon is our man Paulino’s place (English translation is ”Dawn Riser”). 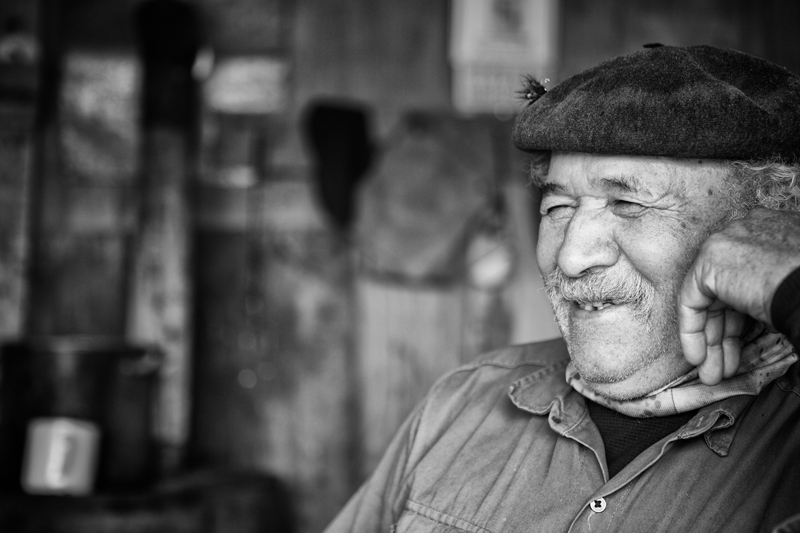 Paulino is truly a living legend throughout Patagonia at large. 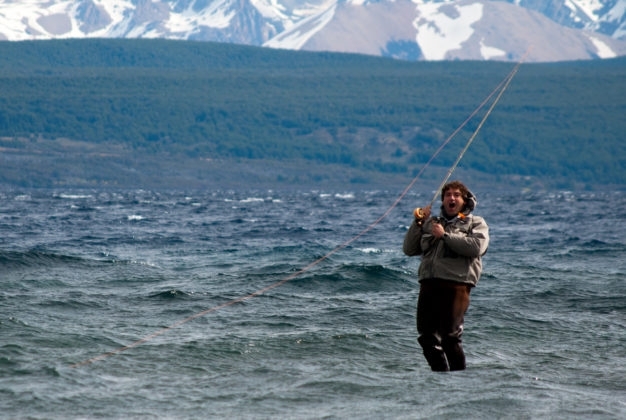 Having picked up a fly rod before most anglers in Argentina had even heard of one, he has by now quite likely forgotten more about the sport than the rest of us will ever know. Most of Paulino’s life has been dedicated to the exploration of Patagonian trout waters, and to teaching the members of a newly emerging sport-culture the rules, responsibilities, and details of the game. 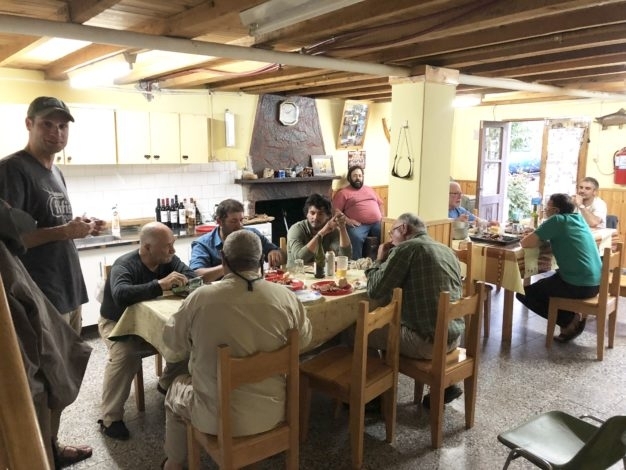 From tying flies and assisting guests, to putting together some of the best Asados in all Argentina, Paulino’s contribution to the Trout Bum program is actually an attraction all its own. 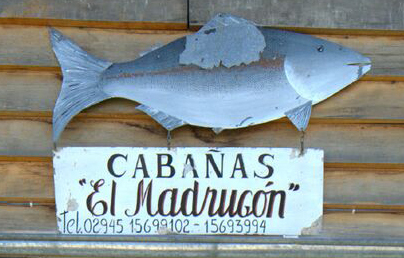 On Paulino’s property up on the edge of town, the Madrugon is a complex of cabins that have been built over the years around Paulino’s house/fly shop. (Paulino probably sells more of his own all-barbless fly patterns from here than every other fly shop in Patagonia combined, and he doesn’t have so much as a sign outside to advertise their availability). The main cabin features a large dining room, kitchen, and fireplace area around which to tell the day’s fishing stories downstairs, as well as two full bathrooms with showers, and a sleeping loft with bunks for up to twelve guests at a time. 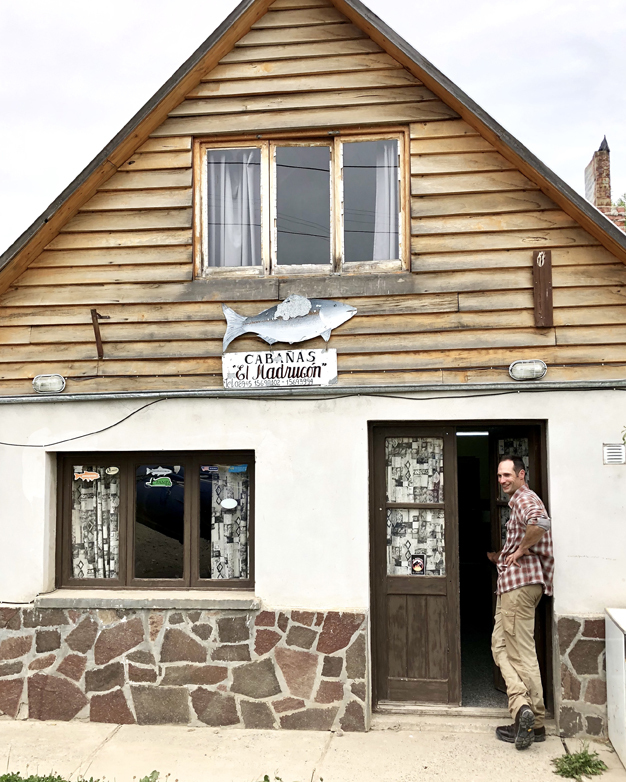 The walls of this main building are adorned with mounts of enormous rainbows, brookies, and king salmon that Paulino did himself more than forty years ago before he became a strictly catch and release fisherman. 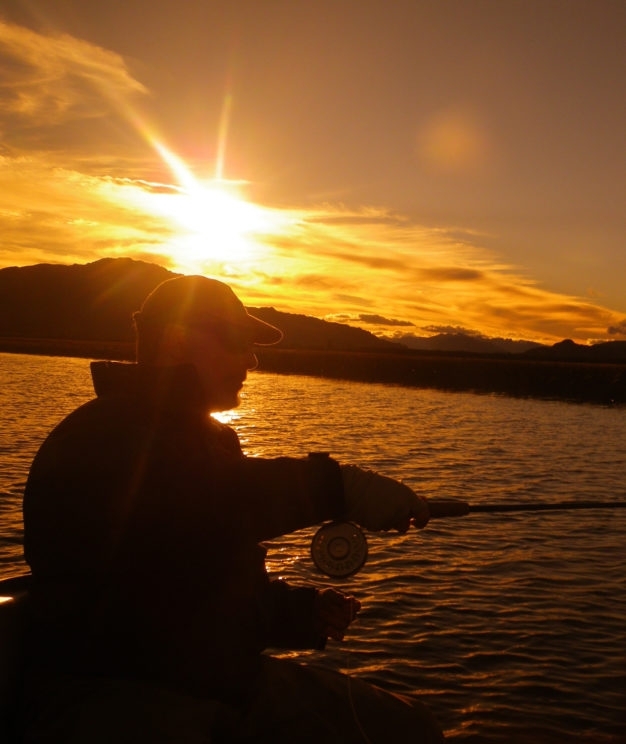 (He won’t even take a fish out of the water these days for a picture, unhooking even thirty-plus inchers while they’re still beneath the surface and watching them swim away while the rest of us croon for a glimpse). While definitely our least luxurious set up (one of the toilets actually has to be flushed by reaching into the wall and lifting up the release valve) it does have an authenticity that is hard to resist, and hanging out with Paulino over the fire while the lamb is roasting provides a great opportunity to learn about the history of the area and its fishing. 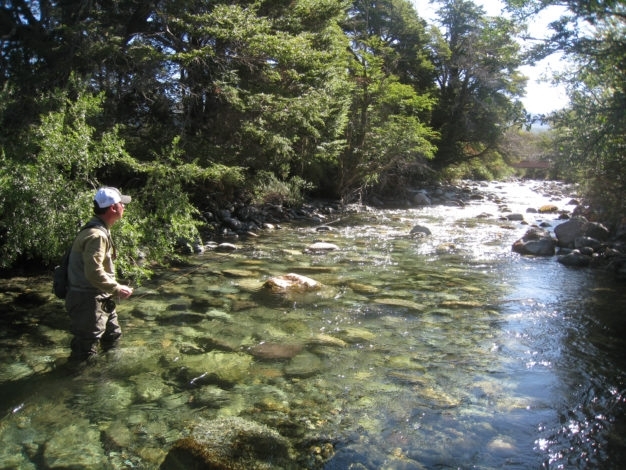 Location: North side of Rio Pico, a ten minute walk from downtown. 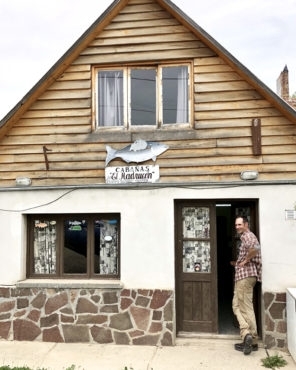 Centrally located such that our guides can go in any of the four cardinal directions each morning which maximizes fishing and minimizes drive time, plus keeps you close the stores that sell wine, beer, and liquor. 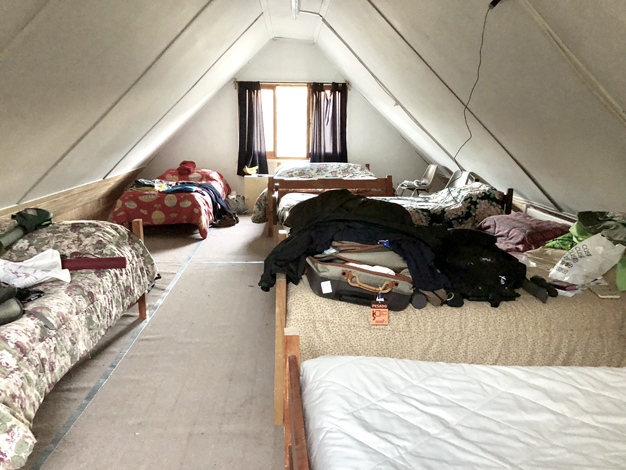 Sleeping arrangements: Loft set up with eight or so single beds and one double, or double bedrooms with bunk beds in the newer cabin next door. 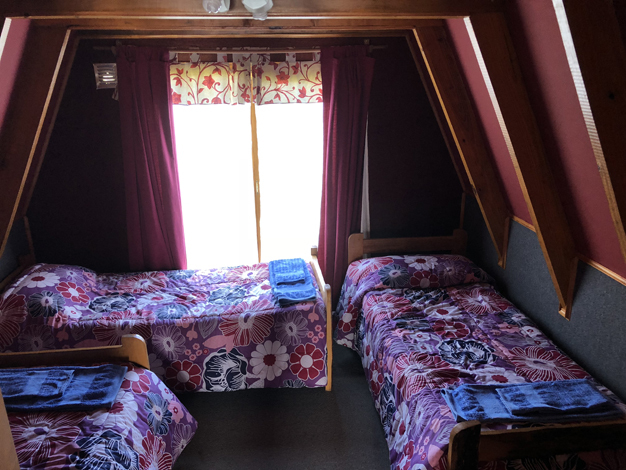 Bathrooms: Two full bathrooms with showers, toilets, and sinks in the main lodge and one bathroom with shower, toilet and sink in the newer cabin next door. 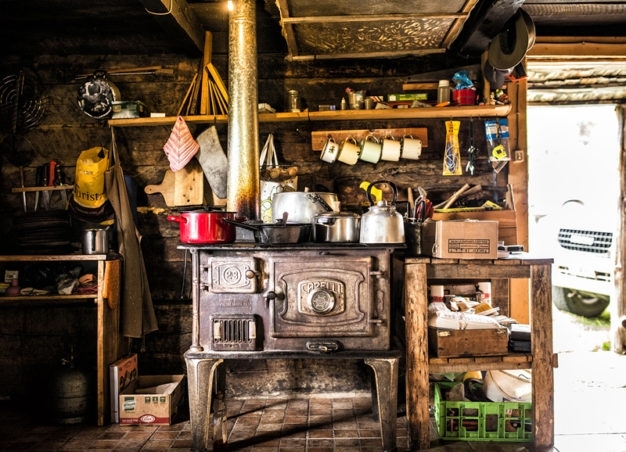 Common areas: Both cabins have living/dining rooms with TV’s and kitchens. 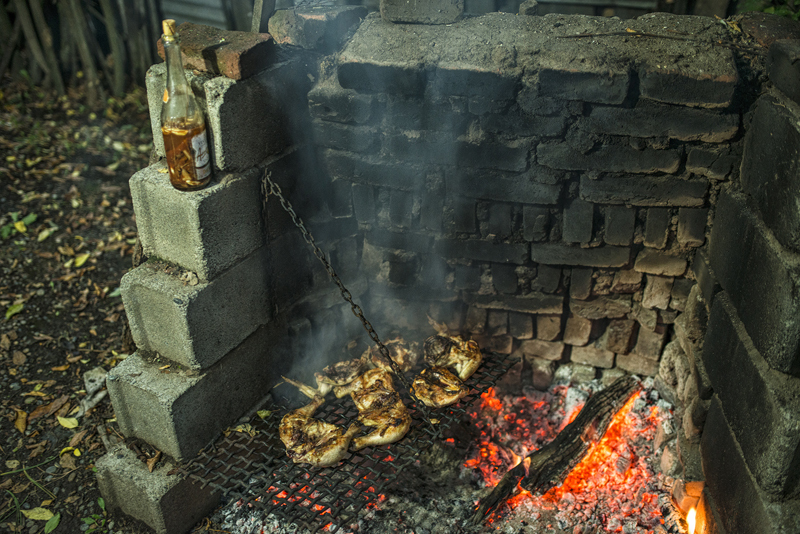 There is also a “quincho” out back amongst the cherry trees where the lamb asados are done over the fire, with chairs and tables for drinking and socializing after the day’s fishing. 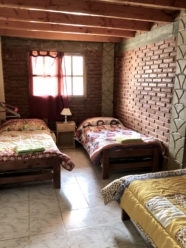 *Paulino's El Madrugon is one of our two most commonly used lodging set up due to its location and versatility and well, Paulino's presence as an attraction all its own. This means that it is important for reservations to be made as far in advance of trip dates as possible! 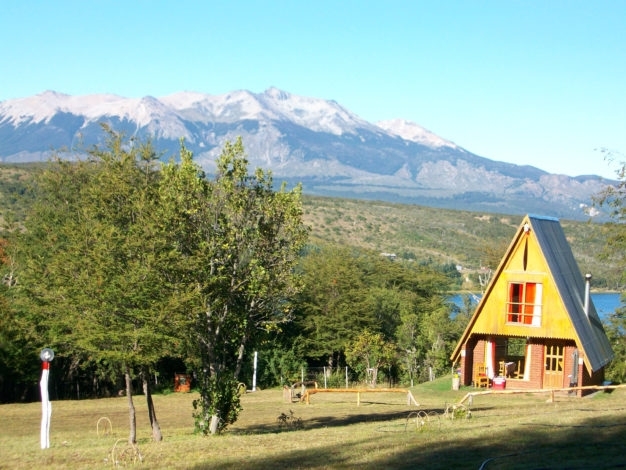 While not quite as centrally located as our other set ups in town, Cabanas Toldos has an attractive style its own and the added advantage of sitting right on one of the best and most famous lakes in all of Patagonia. 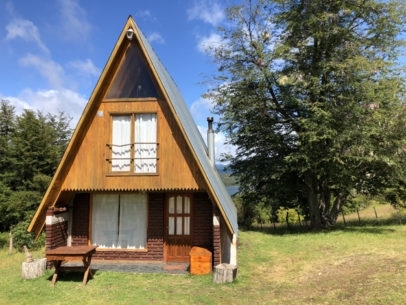 These A-frame cabins are reminiscent of the high alpine architecture that calls to mind winters with a lot of snow, and topographies with a lot of wind, both of which they have withstood on Lago 3 now for many years. Location: Lago Tres, a twenty to thirty minute drive from Rio Pico (depending on road conditions). Sleeping arrangements: Loft set up with two triple rooms, single beds. Bathrooms: One full bathrooms with shower, toilet, and sink. 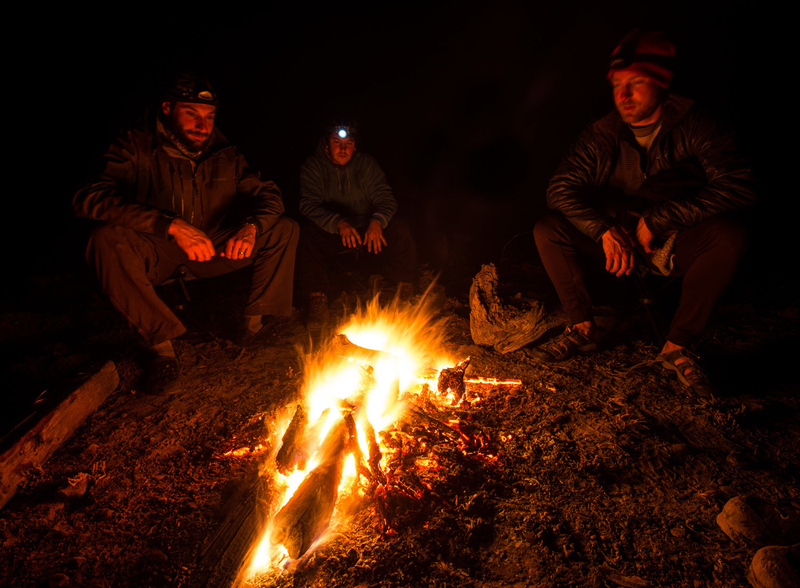 Sometimes we get folks who are looking to head out into the back country and camp, accessing even more isolated waters than the ones we can drive to in a Hilux. And so the backpacks get loaded, the truck gets left at the end of the road, and in we walk to the spots that don’t get talked about after we come back out. These walks are not for everyone. 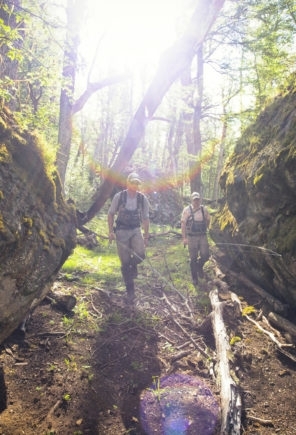 Generally speaking when we do back country trips the campsite is set up somewhere around ten miles from the truck, and the rivers we are fishing and the country we are walking requires strong legs and a steady resolve. 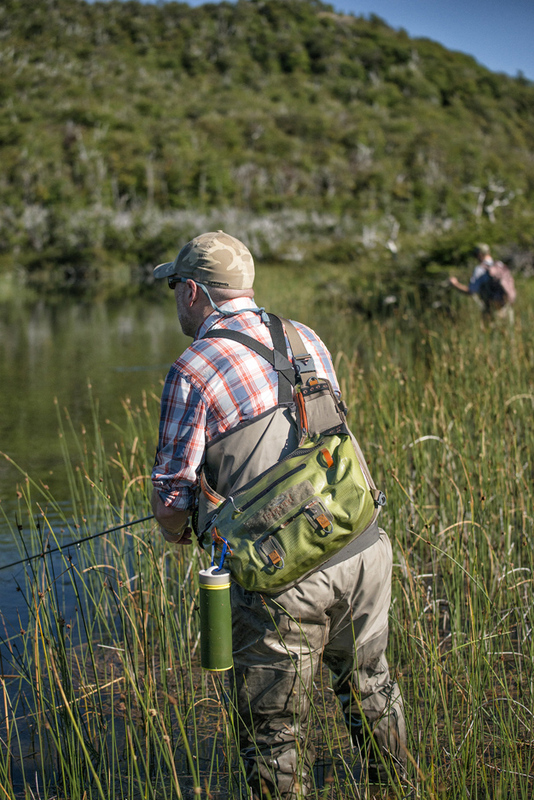 Clients planning to do a back country trip as part of their Trout Bum program should plan to bring their own backpacks and sleeping bags/pads, as well as any other personal items they usually like to have with them while camping. Our team will supply tents, cooking equipment, and everything else that is needed. 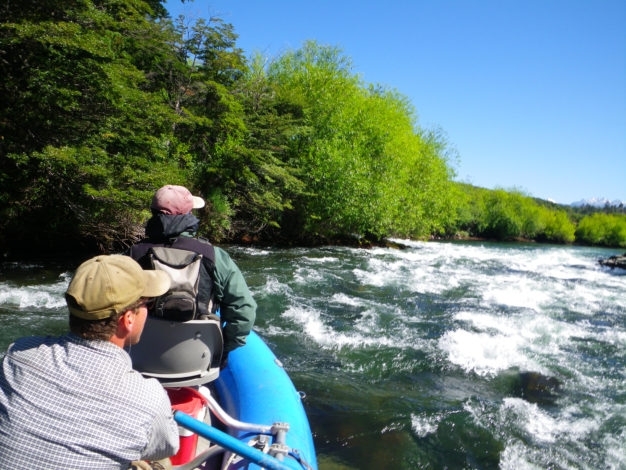 It is also very important that if a back country excursion is to be part of the Trout Bum itinerary that this is discussed with us at the time of the trip’s booking, since our in-country preparations for that option are quite different than they are for a group staying at the Madrugon. Location: Variable, and generally not something we’d prefer to have talked about or posted online after the trip. Sleeping arrangements: Tents, generally double occupancy. Cost: $400 upcharge - It may seem odd that we should have to charge more for back country camping, but the truth is that the logistics are just far more complex and demanding. 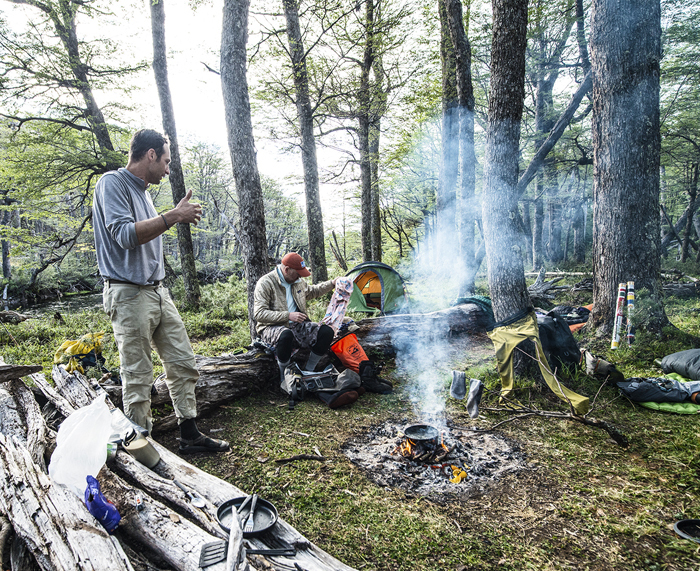 Generally this requires an “auxiliar” (assistant guide) to accompany each guide/client pair, and that expense plus the maintenance of gear is actually greater than the expense of lodging. 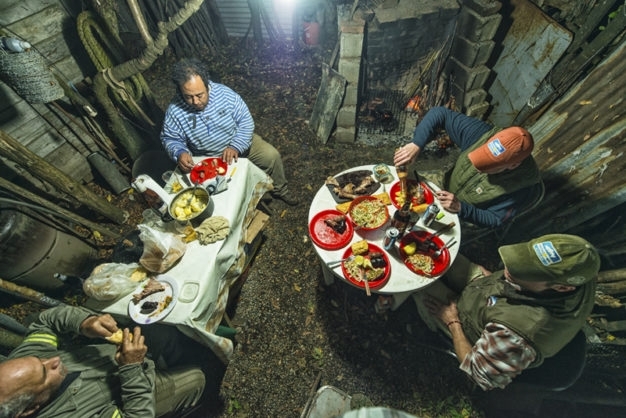 While there are certainly no chef’s hats or tiny portions daintily set in the middle of huge expensive plates on our Trout Bum excursions, folks who are accustomed to good solid home cooking or fireside campsite fare will find nothing lacking on the menu either at meals or while out on the water with our guides. Snacks, tea, coffee and soft drinks, as well as the classic Argentine Máte are all available all day long in addition to the three square meals that keep you fueled for your adventures every day. Breakfasts include a choice of eggs, cereals, breads, fruits, and all the standard North American fare. Lunches served out on the water are varied each day, but generally include sandwiches, chips, sweets, and snacks. Dinners are multi-course affairs beginning with appetizers on the table when you arrive back from the day's fishing, then main dishes and sides/salads representative of a mixture of North American and South American styles. 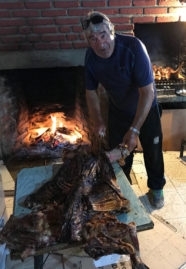 Each week a traditional Argentine Asado (whole or half lamb slow cooked over an open fire) is also served, which is always one of the highlights of the trip. Alcohol is not included in the Trout Bum package, but your guide will be more than happy to stop by the store so you can pick some up on your way into and out of the back country any day. 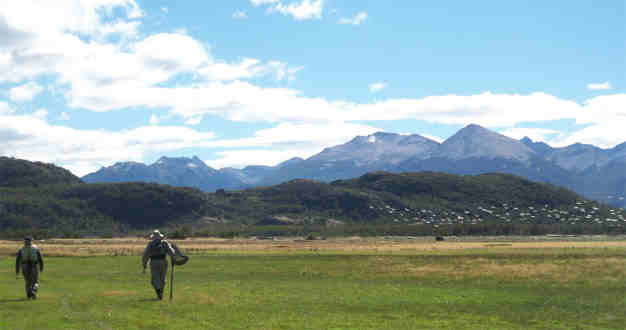 Flights for the Trout Bum Rio Pico Itinerary should arrive in Esquel, Argentina (Airport code ESQ). You will most likely arrive in Argentina by landing at Buenos Aires International Airport (EZE) and will then need to board a ground transfer (bus or cab of approx 45 minutes drive across the city) to Buenos Aires Domestic Airport (AEP) for your flight down to Patagonia. 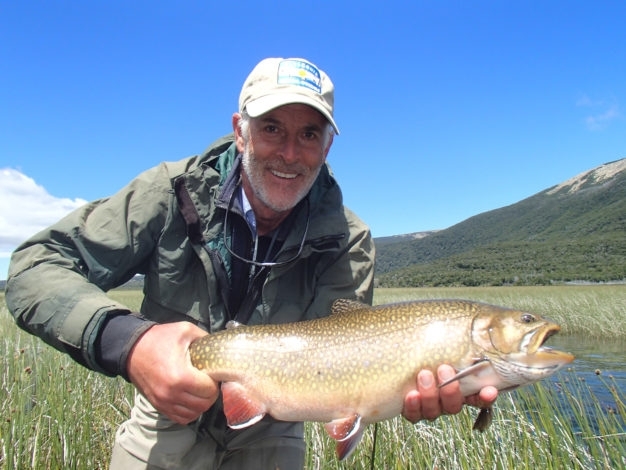 For the Rio Pico Trout Bum itinerary, the preferred airport of arrival is Esquel, but sometimes flight schedules require our guests to fly into Bariloche (three hours drive to the north) instead. 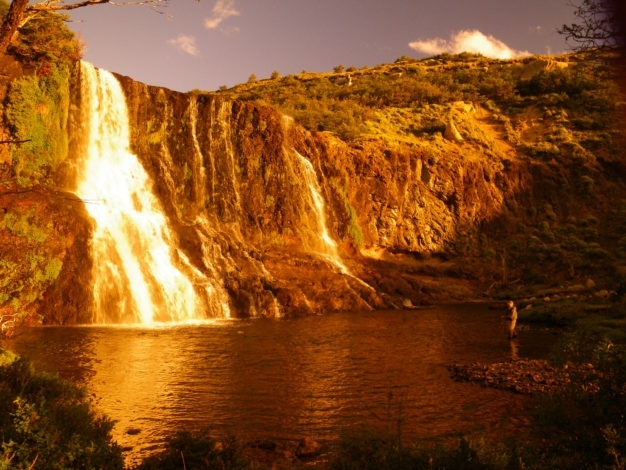 In these cases an additional ground transfer fee of $350 will be added to the trip’s total cost. The season for our Rio Pico Trout Bum Program runs from November 1st until May 1st each year. 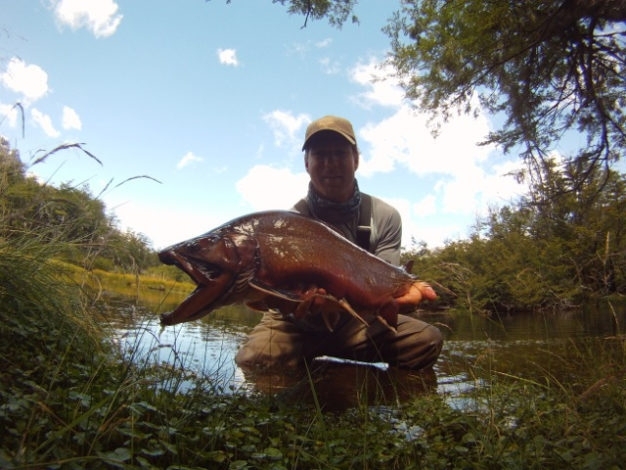 Early season (Nov/Dec) and late season (Mar/Apr) see spring and fall runs of migratory spawners in their respective environments, while the middle of summer (Jan/Feb) generally holds the most stable weather patterns and warmest temperatures. Package rates are per person based on double occupancy, and include everything except flights, fishing licenses, alcoholic beverages, laundry, and guide/staff gratuities. 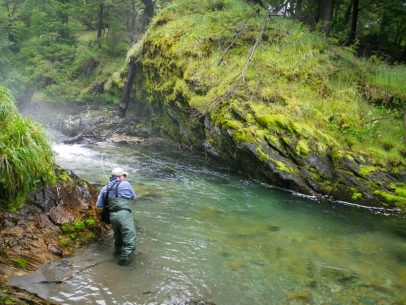 *Custom planned trips are also available for this destination; Contact us today for available dates and details, and get started on your way to this dream-trip of a lifetime to see just why the Rio Pico Trout Bum has captured the hearts and imaginations of so many fly fisherman from across the globe. 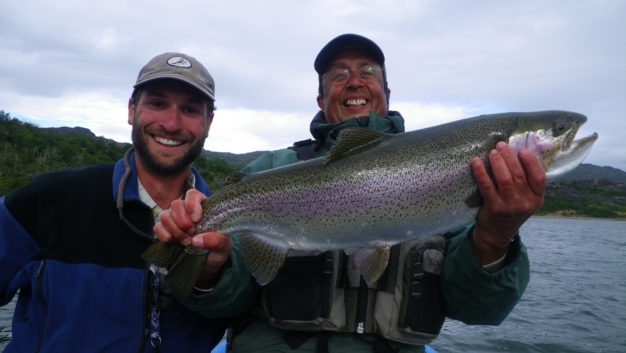 Contact us today for available dates and details, and get started on your way to this dream-trip of a lifetime to see just why Patagonia has captured the hearts and imaginations of so many fly fisherman from across the globe. 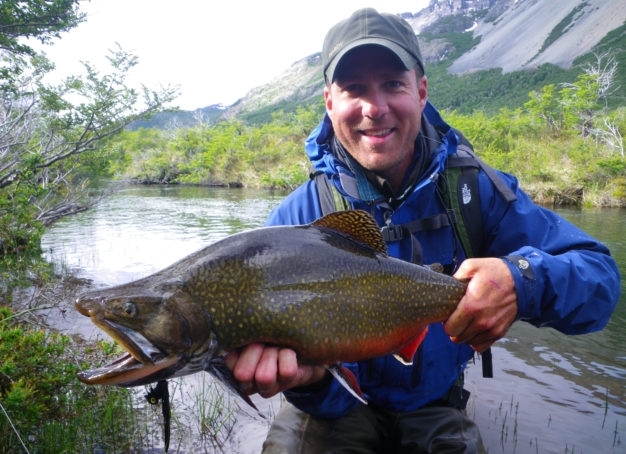 Argentina simply has the biggest brook trout in the world. 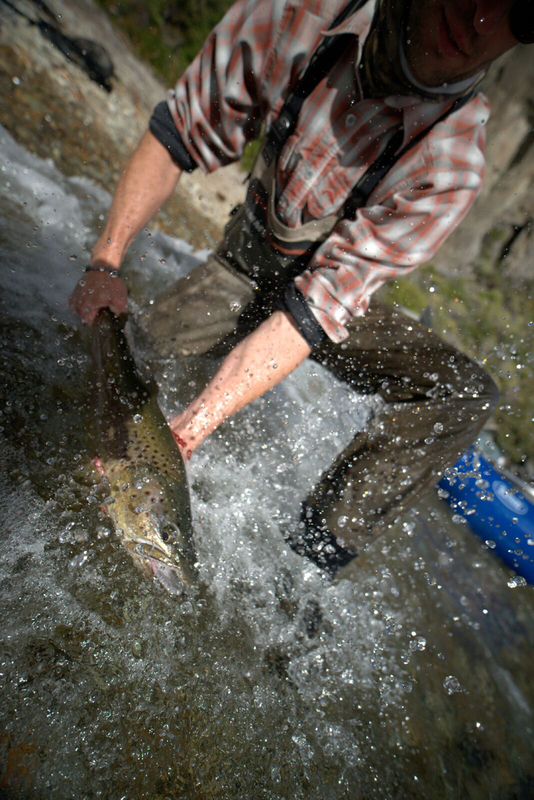 Small stream - BIG fish.